Besides opening up presents tucked under the tree, one of our favorite Christmas traditions is unpacking stockings. With stocking stuffers, the smaller the better: the best options are thoughtful or humorous gifts that can fit into the palm of your hand. If you’ve already got the big stuff out of the way, then follow our guide to stuffing your loved one’s stockings. Handmade soaps from Apotheke are the perfect size for a stocking stuffer, and we’re particularly fond of their charcoal bar. A combination of cedar wood, sandalwood, and charcoal powder, this bar is mildly scented, and perfect for daily use. The Charcoal Bar is available from Apotheke, and retails for $8. Virtual reality is all the rage these days. And if you’re looking for a fun low-tech option, consider gifting Google’s Cardboard VR headset. Insert your smartphone, and get ready to see the future. Google Cardboard is available through Google, and retails for $15. The slim and compact design of the Teakwood Bottle from S’well makes it the perfect stocking stuffer. With a double walled stainless steel shell, it’ll keep cold drinks cool for 24 hours, and hot drinks pipping for up to 12. The Teakwood Bottle is available through S’well, and retails for $35. This ice cream scooper has a heat-transfer handle that allows you to doll out perfect scoops, without waiting for ice cream to thaw. With a matte black finish and a sleek design, this one-of-a-kind ice cream scooper makes for the perfect stocking stuffer. The Scoop That! Ice Cream Scooper is available through Bed, Bath, and Beyond, and retails for $20. A step above the standard set of bones, these dominos eschew the usual black dots for a a series of nautical flags. Nestled in a handsome wood box, this set of dominos makes for the perfect stocking stuffer. The Flag Dominos are available through Fredericks & Mae, and retail for $38. For a stocking stuffer with a bit more pizzazz, consider the Andrew Cardholder from APC. Constructed with vegetable-tanned Spanish leather, this slim bi-fold will be much appreciated, in a stocking or under the tree. The Andrew Cardholder is available through APC, and retails for $130. 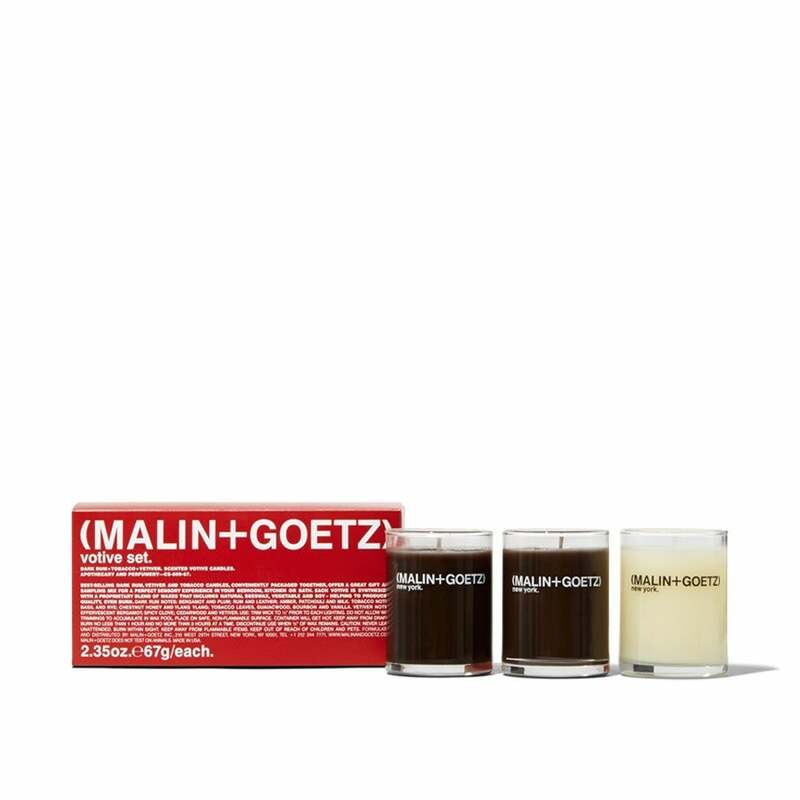 Candles make for a great stocking stuffer, and we particularly like the Votive Set from Malin and Goetz. A triplet of their best-selling candles, this set is made from earth-friendly materials, for a guilt-free olfactory experience. The Votive Set is available through Malin and Goetz, and retails for $45. For a chic organizational piece, consider gifting this pencil pouch from Poketo. Constructed with a single piece of vegan leather and a small silver button, this nifty pouch is perfect for pencils, pens, headphones, or anything else that might get lost in your stocking. The Minimalist Pencil Pouch is available through Poketo, and retails for $24.